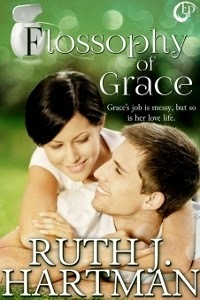 From Goodreads.com: What happens when a dental hygienist falls in love with her patient? That's what Grace Hart finds out when she meets Bruce Gardener. The problem? Grace's boss has a strict policy against relationships with patients. Can Bruce and Grace find a way to be together, without her boss finding out? Another laugh-out-loud hit from Ruth J. Hartman! I am an avid fan of Ms.Hartman's historical novels, so when I saw she had a contemporary novel, I had to read it! As always when I am reading one of her works, I found myself laughing out loud several times (and may also have gotten a couple dirty looks from people from being a bit too loud about it). From the endearingly sweet couple of Bruce and Grace, to the deviously annoying Dr.Beeth (yes his name does rhyme with teeth), this novel has something for everyone. You will find yourself cheering on the characters as they do anything to thwart Dr.Beeth's orders, and you may even find yourself contemplating giving Dr.Beeth a good smack upside the head (just remember, he's a fictional character as you can't)! I would definitely recommend this novel to those who love a good, sweet romance.